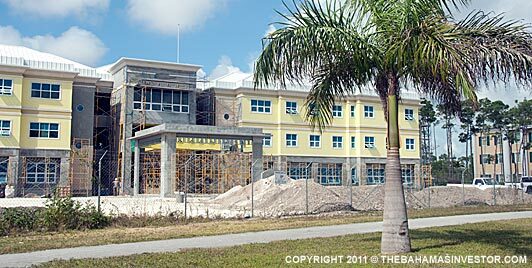 New government office buildings on schedule to be completed by summer this year. The $19-million administration complex in the centre of Freeport will house a variety of government departments. 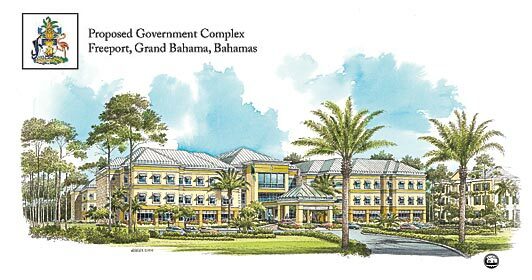 The $19-million government complex in Freeport, Grand Bahama, is well into the construction phase, with the majority of the office building nearing completion. The 65,000 sq ft facility will house various government departments and is scheduled for completion by August 2011. The construction is being carried out by FES Construction Co Ltd.
“The complex will create 250 new jobs in the construction sector all told and spin-off effects for the wider community,” according to Minister of State for Finance in the Ministry of Finance Zhivargo Laing. It is hoped that the new buildings will help shift some of the government’s administrative duties to the nation’s second city. On 20-23 March this year the Bahamas Institute of Financial Services (BIFS) will host the high-profile international forum bringing together leading professionals in the finance sector to discuss the way forward for the financial services industry. This will be only the second time the region has hosted the event. The Bahamas Institute of Financial Services (BIFS), along with other participating organizations, have been working hard behind the scenes to put together one of the banking industry’s largest forums. Third annual Bahamas International Maritime Conference and Trade Show (BIMCATS) held in Grand Bahama last week, attracted a large turnout of international and local maritime industry players. The three-day event focused on training and career development for seafarers. 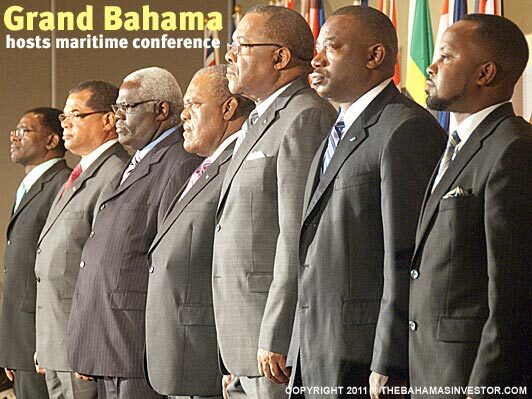 Addressing the third annual Bahamas International Maritime Conference and Trade Show (BIMCATS) held in Freeport, Grand Bahama, last week, Prime Minister Hubert Ingraham reiterated the nation’s commitment to the maritime industry and highlighted the sector’s contribution to the island nation’s economy. First ever comprehensive report highlights achievements, focus for 2011. In-line with its commitment to transparency and accountability in the exercise of its functions, the Office of the Attorney General (OAG) released Report 2010 at the beginning of this year. The document outlines the role of Attorney General and Minister of Legal Affairs and his team in the nation’s justice system, and their achievements over the last year, as well as their goals for 2011. Deputy Prime Minister and Japanese Ambassador sign Tax Information Exchange Agreement in Nassau last week, bringing the total number of TIEAs inked by the Bahamian government to 23. This is the second agreement finalized with a major Asian economy, following one with China. Vastly outstripping the number of Tax Information Exchange Agreements (TIEAs) required by Organisation for Economic Co-operation and Development (OECD) member nations, The Bahamas last week officially concluded a tax treaty with Japan. The requisite number of TIEAs stipulated by the OECD for international tax compliance is 12. The Bahamas has now signed TIEAs with 17 OECD members and nine members of the G-20. As the US continues its global initiative for greater transparency and compliance in regards to the financial dealings of its citizens, increased regulations are becoming an occupational hazard for financial services providers in offshore jurisdictions. The latest raft of compliance measures addresses operational accounting methods and will come into force on January 1, 2013. Last year had its challenges, but Bahamas Realty founder, Robin Brownrigg, is optimistic signs of growth will start to show in 2011. The veteran realtor says that prudent lending by Canadian banks insulated the island nation from the worst of the crash. Despite a recent drop in house values and sales, the future looks bright for the Bahamian real estate sector, according to industry leader Robin Brownrigg, president and founder of Bahamas Realty. Despite a tough year financially last year, Brownrigg believes that the sector is poised for recovery and has weathered the storm well–partly due to its reliance on Canadian rather than US banks. A petroleum company remains confident that The Bahamas could prove to be an untapped well for oil and gas discoveries, although decades of sporadic explorations have met with negligible success. “The potential for supergiant fields is present, possibly half a billion barrel fields and greater,” says Dr Paul Crevello, Bahamas Petroleum Company Plc (BPC) chief operating officer. Winterbotham Trust Company Ltd founder Geoffrey Hooper established the financial services firm in 1990, after spending many years in banking in Spain and Latin America. It was while working in Uruguay for Lloyd’s Bank that the banker saw an opportunity to branch out on his own, initially targeting two niche markets: back office accounting and basic banking services. In an effort to bring investors the most relevant, up-to-date and easily accessible information about living and working in The Bahamas, Etienne Jr Dupuch Publications Ltd has completely overhauled The Bahamas Investor magazine’s website thebahamasinvestor.com.